If you’re a UC chancellor making big bucks, what restrictions should there be on your “outside work”? 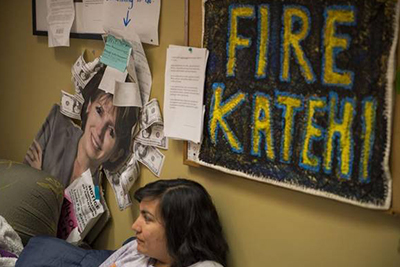 That issue in on the UC regents agenda this week, after criticism from students, staff and the media swirled around suspended UCD chancellor Linda Katehi over her role on corporate boards, reports the Sacramento Bee. Katehi was paid $420,000 in stock and fees by a textbook company and held a $70,000-a-year seat at a for-profit university that may have constituted conflicts of interests. A new controversy is dogging Berkeley Chancellor Nicholas Dirks, following criticism over his handling of sexual harassment complaints and household expenses. Now he is being investigated for his use of “complimentary personal training services and access to campus fitness facilities,” which the East Bay Times says “has struck a nerve.” English professor Celeste Langan, co-chair of the UC Berkeley Faculty Association, is quoted in the Mercury News as saying, "I think there is very, very little, almost no confidence in this chancellor's leadership." UC Berkeley has “renewed the $150,000 annual contract of Damon Harrington, the football strength coach mired in a controversy related to the death of one player and the hospitalization of another,” according to the San Francisco Chronicle, despite the urging of faculty “not to renew Harrington’s contract” until completion of an inquiry into his actions.